Both sides of my parents’ families have deep roots in Virginia and West Virginia, but even though New Mexico is far-flung from the Appalachians, I’m not the first Morton to land in the Land of Enchantment. Two generations ago, my grandfather graduated from the New Mexico School of Mining in Socorro and several generations before that my great, great, great Uncle, William “Buck” Morton, met his end in New Mexico in 1878 at the hands of none other than Billy the Kid. 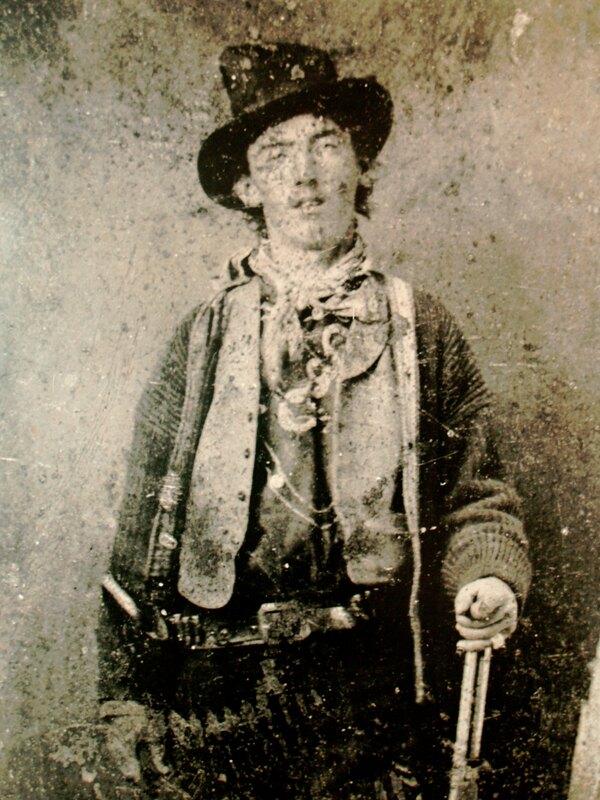 Billy the Kid, also known in his short life of 21 years as William Henry McCarty, Henry Antrim and William H. Bonney is one of the West’s most famous outlaws. Bonney’s notoriety exploded after his involvement in the Lincoln County War in south central New Mexico where, over the course of six bloody months, two rival factions battled over control of the dry goods trade in Lincoln County, resulting in the deaths of several men and the birth of more than one legend. My family has its own Billy the Kid legend. After Uncle Buck Morton played a hand in ambushing and murdering John Tunstall, a wealthy English merchant looking to set up shop in Lincoln County, a brazen act that kicked off the Lincoln County Wars, Buck wrote a letter home to his brother Quinn Morton in West Virginia, fearing for his life. Buck warned Quinn that a man named William Bonney had it out for him and that if he disappeared, Quinn should have somebody track down this no good outlaw Bonney. Sure enough that letter was the last anybody ever heard from Buck Morton. After Buck disappeared, Quinn took the letter to a Judge Hunter Holmes Marshall in Virginia. There the trail runs cold and it’s unclear if Buck’s death was ever investigated. An outlaw himself, Buck probably got what he had coming to him. When I told my family I was moving out to New Mexico, my father told me he hoped I had better luck in the Land of Enchantment than Buck Morton. On my road trip West, I decided to pay my respects to Uncle Buck by stopping in Lincoln, which has been preserved as a National Historic District by the National Park Service. Now part of rural scenic highway 380, Lincoln’s Main Street was once the most dangerous street in America, ground zero for the Lincoln County Wars and Billy the Kid’s legend. Here the Kid, awaiting hanging, shot his way out of jail and escaped on horseback. 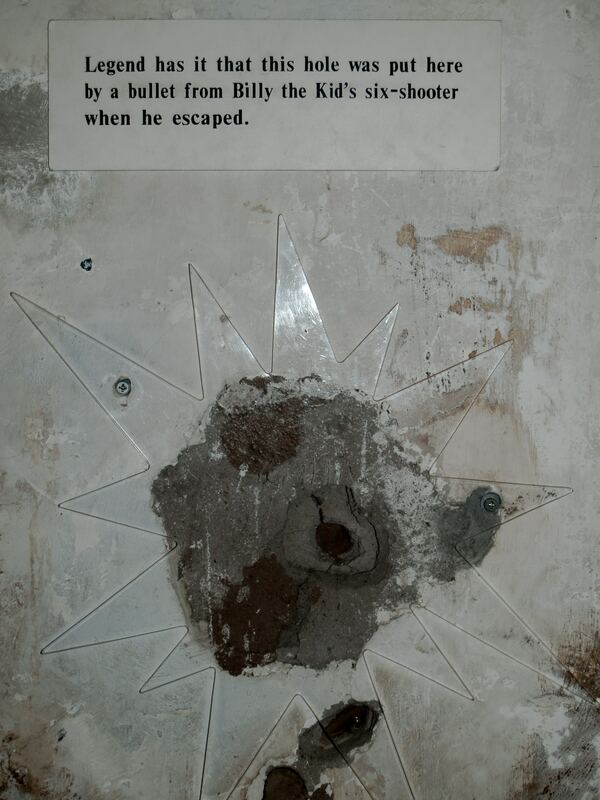 The jail is still standing, complete with bullet marks in the walls supposedly left during Billy’s grand exit. The park service also keeps a small museum in Lincoln, displaying artifacts from the Wild West days and information about the Lincoln County Wars, including portraits of all the main players including Billy and Pat Garrett, the Sheriff who eventually shot down the Kid on July 14, 1881. 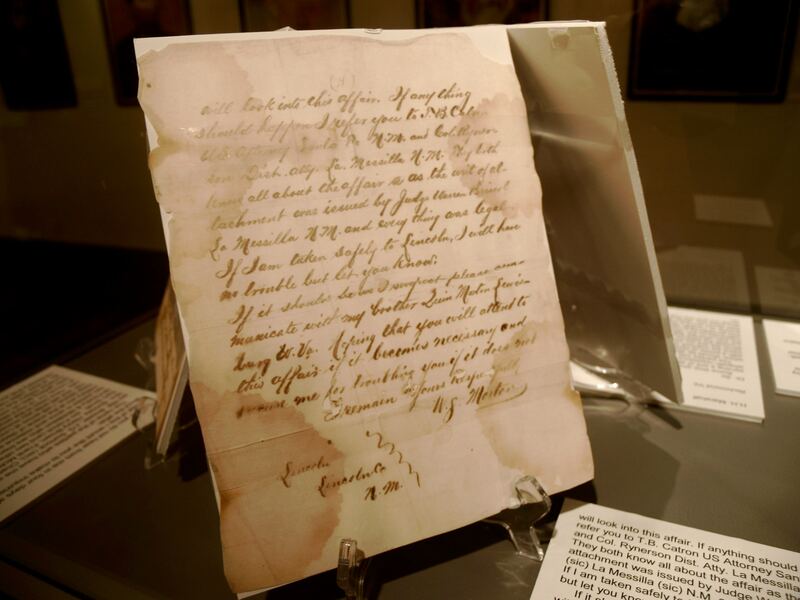 As I was perusing through the museum, a handwritten letter in a glass case caught my eye. It was labelled “Letter From A Man About To Die”. Sure enough, it was the original letter from my Uncle Buck! While I was taking photographs of the letter the park ranger on staff at the museum came over to ask if I had any questions and I told her I was the great, great, great grand niece of the “Man About to Die”. The ranger immediately went back to the front desk and pulled out a notebook labelled “Kin to the Lincoln County War Legends” and had me sign my name alongside descendants of William Bonney, Pat Garrett, and John Tunstall. Lincoln is still pretty far out in the middle of the Wild West so I had to drive quite a few miles down the road before I got enough cell signal to call home and tell my father I had found Buck Morton’s long-lost letter. 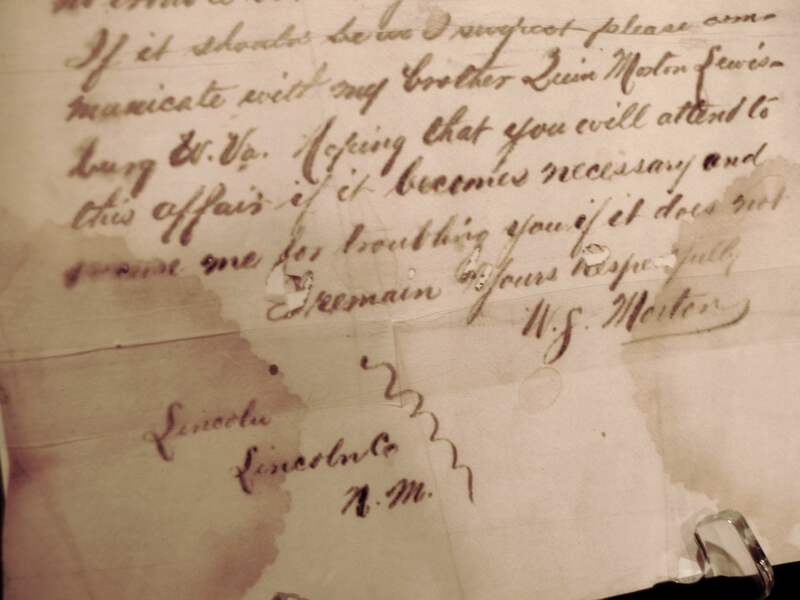 How the park service ended up with his letter is a mystery, but it’s fitting it ended up back in Lincoln. Two years ago my dad got a phone call from a U.S. Marshall and amateur historian who thought he had located the likely resting place of Buck Morton and needed permission from a surviving descendent to dig him up. My dad told him to go ahead and that if he found a tooth, he’d be willing to extract DNA and confirm whether it was in fact Buck Morton (my dad’s a physician who specializes in treating rare genetic disorders in Amish and Mennonite children, so he has access to a DNA sequencer), but nothing was ever recovered. Then last summer, dad was contacted by a representative of New Mexico Governor Bill Richardson’s office who wanted to let my dad know that Richardson was considering pardoning Billy the Kid. My dad said he didn’t have strong feelings about it either way, but vehement protests, especially from the descendants of Pat Garrett, eventually squashed that idea, which was really just a ploy for publicity and tourism. One final New Mexico connection: As it turns out one of my neighbors here in Cerrillos, Bob Marshall, is a descendent of that Judge Marshall in Virginia. What a small world this can be. Click here to read the rest of Buck Morton’s letter and see more photos from Lincoln, New Mexico. This entry was posted in New Mexico, Road tripping!, Uncategorized and tagged billy the kid, lincoln county war, New Mexico, pat garrett, wild west. Bookmark the permalink. An unfortunate time in US history that John Tunstall had to die an unnecessary death. Who knows how the West, or America for that matter, would’ve turned out? For whatever reason, The Kid felt compelled to reconcile that tragedy. If he didn’t who knows what kind of person William H. Bonney would have become? To reiterate, EVERYONE, except Tunstall, got what they had coming to them. Final thought, looking at how the burial proceedings should’ve went, (by tradition) Pat Garret is a liar.